Coming off the success of the film Black Swan for which the Mulleavy sisters created those dazzling and intricate swan costumes, fans of Rodarte were waiting in anticipation as to what this seasons collection might hold. Surprisingly, last seasons Northern California arts and crafts them has made way for a softer Great Plains inspiration for Fall. The first look was subdued: a simple bouclé wool coat — long and lean, cinched at the waist and flared — worn over a dotted creamy chiffon dress. The message seemed to be one they have touched on before: There’s no place like home(spun). The collection continued, from the palette (mostly honey, tawny and oat) to the fabrics in rough-hewn wools, floral and guipure laces and mohair knits. The season’s geometrics came in Amish quilt motifs, seen in the sweaters and pinaforelike tops (patchworked from leathers and pony hair) as well as the tough, tribal-looking footwear with Native American beadwork. Dresses, with their slight bishop sleeves and prairie vibe, looked Laura Ingalls chic, while the floor-sweeping coats (the collection’s highlight) featured the occasional cutout and crisscross straps for visual intrigue. 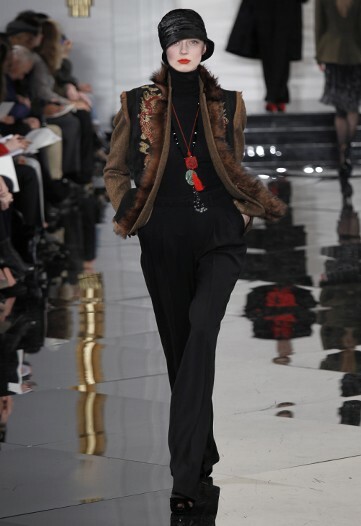 As a counter part to Rodarte the Ralph Lauren collection usually filled with bits of Americana took a cue from China (much like de la Renta) in a decidedly East meets West theme with plenty of deco references thrown in. It reminded me in many ways of the gorgeous and decadent costuming from the 1987 film The Last Emperor. Lauren opened quietly, with a glam white shirt-black trouser look that might indeed befit a film star of yore, the model’s red-and-black shoes an early glimmer of the Chinese motif ahead. In fact, the mostly black lineup featured a good amount of classic tailoring, which, when worked in high-gloss fabrics, played well to the exotic mood. There were also tony tweeds over beaded dresses and some surprising streety pieces (a leather motorcycle jacket, a silk puffer with multiple zippers), their toughness tempered by ladyfied styling. The Chinese references came discretely at first, in shoes, jade and coral jewelry, flashes of red. Eventually, the point came into full flower as sleek cheongsams shared the runway with flapper chemises, and demonstrative Chinoiserie-themed embroideries appeared. While the red silk smoking jacket hammered the point with uncharacteristic indiscretion, lavish vests and cocoon coats more gracefully recalled French Deco’s obsession with Orientalism. There was nothing costumey about Lauren’s gorgeous eveningwear, whether black columns with geometric beadwork or a pair of glorious, rich-hued diva gowns, one in burgundy velvet, the other, in fluid jade silk.